A partial denture is a removable appliance used to replace missing teeth. Partials help the remaining teeth stay in position, improve the ability to speak, and equally distribute chewing stress throughout the mouth. Its use is generally recommended for a patient who has too many teeth missing to properly support a fixed bridge, but who doesn't yet need complete dentures. A partial denture holds artificial teeth in place with a base that saddles the gums, and retainers that clasp onto adjacent teeth. If properly cared for, they can last as long as a fixed bridge. 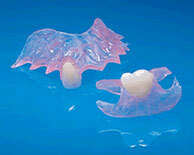 Their low cost also makes them advantageous to patients needing only one or two replacements of missing teeth. Maintaining a close fit is important in order to keep a partial functioning properly, so it should be checked at least once a year. Full dentures are a complete set of artificial teeth used to replace natural teeth lost because of disease or decay. There are two primary methods for fitting dentures. The teeth can be extracted and the gums and jaw allowed to heal before the dentures are fitted, or dentures can be prepared in advance and inserted immediately after the extraction. Immediate dentures are more aesthetically pleasing, but they often require several fittings as the jaw heals and changes shape. They also allow the advantage of never needing to appear without teeth. Because dentures are foreign to the mouth, they require a certain period of adjustment. Denture wearers must learn to chew and speak with a new set of teeth. However, they can be advantageous to older wearers by adding fullness to lips and cheeks, and helping to reduce the appearance of mouth wrinkles. They also provide an alternative to patients with dental disease that want to avoid extensive treatments. Dental implants have advanced tremendously in the past two decades. Patients who previously had to be condemned to wearing loose fitting dentures now can often have their missing teeth replaced with implants. Healthy teeth do not always have to be cut down to install dental bridges because a missing tooth can now be replaced with dental implants! In the past, many patients were refused this procedure because of a lack of adequate bone. Today, bone grafting methods have been developed to add bone to a patient's jaw to make placing dental implants possible. The problem of missing teeth is common for many people who have had teeth removed because of extensive cavities, gum disease, injuries, and those who may not have developed some of their teeth due to an inherited trait. 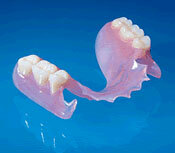 Our partial dentures have no metal clasps and are very light weight. The material is translucent, so the patient’s own gums show through, giving a very natural appearance. Non-metal partial dentures can be used to replace many or few missing teeth, and can even be modified to replace a missing tooth on only one side of the mouth, greatly enhancing its comfort. Non-metal partial dentures are an excellent option for the replacement of missing teeth. The cost of treatment is usually much less than either a permanent bridge or dental implants and can be completed in just two or three short visits. Digital radiography's technology improves and simplifies the way we care for our patients' teeth, resulting in better dental evaluations and treatment decisions. Traditionally, dentists find out what's going on inside your mouth by taking a series of x-rays, developing them in a darkroom full of chemicals, and then examining the resulting films on a special light board. This cumbersome process is entirely outmoded by digital radiography. Now, you simply relax in the dental chair while a tiny sensor is positioned briefly inside your mouth. The sensor acts like a miniature VCR camera, except that its chip is sensitive to x-rays, not light. Our patients are exposed to 50%-90% less radiation than with traditional x-ray techniques. A highly detailed image is almost instantaneously translated onto our computer screen, carrying with it all the conveniences of other digitized images. The immediately viewable picture on the computer screen allows us to discuss the findings with you without delay. Together, we can examine the outer and inner structures and tissues of each tooth, as well as the surrounding roots, root canals, and gums. What may have previously been mysterious and frightening is suddenly rendered reasonable and non-threatening. On the spot, we’re able to clearly and simply explain all the steps of any recommended restoration procedures. And because it helps you clearly understand the root issues behind your dental health, we're able to work together to determine the very best treatment options for each case. For those patients and family members of those patients who have snoring problems. 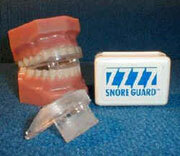 The Snore Guard is a removable appliance that can eliminate or reduce snoring. The appliance can be fabricated in the office in one visit. The appliance is worn comfortably during sleep and is effective for most patients. It works by moving the lower jaw forward allowing the airway to stay open during sleep. Obstructive Sleep Apnea(OSA) can often be successfully treated with a dental sleep apnea device. With OSA the tongue falls back into the throat while the patient is sleeping and blocks access to the lungs. It's like being strangled. A sudden lack of oxygen signals death to the patient's body so the body immediately responds by shaking. An OSA patient can have many of these episodes during sleep. A common treatment for sleep apnea is called "continuous positive airway pressure," or CPAP. In this treatment, you wear a special mask over your nose and mouth while you are sleeping. The mask will keep your airway open by adding pressure to the air you breathe. It helps most people who have sleep apnea. Treat yourself to a new toothbrush every three to four months, or sooner if the bristles become worn, splayed or frayed. Most toothbrushes that are sold today are medium or soft bristled. This prevents the bristles from irritating the gums. A hard, brittle brush can injure your gums. Children's brushes may need to be replaced more often, as they can wear them out more quickly because they seem to chew on them. Thorough brushing twice a day, and cleaning between the teeth daily with floss or other interdental cleaners, removes plaque. Keep these tips in mind when brushing your teeth. Place the brush at a 45-degree angle to the teeth and use a gentle tooth-wide, back-and-forth motion. Remember to clean the inside teeth surfaces where plaque deposits are heavy, and clean the back teeth and tongue. Replace your brush when the bristles become frayed or worn — about every three to four months. When flossing, keep in mind these tips. Gently ease the floss between the teeth and gumline, never snap it. Form a "c" against the sides of both teeth and gently rub the floss up and down the tooth, moving it from under the gumline to the top of the tooth. Establish a regular pattern of flossing and remember to floss the backside of the last teeth. If you use interdental cleaners, ask us how to use them properly, to avoid injuring your gums. Chronic bad breath is a problem for over 90 million people. Typically, halitosis is caused by poor oral hygiene that leaves decaying food particles and bacteria in the mouth. Or, it may be due to gum disease and tooth decay. In either case, decay and debris produce sulfur compounds just like the kind found in rotten eggs, resulting in foul-smelling breath. Although many people try breath mints, over-the-counter mouth rinses or sugar-free gum as a means of controlling bad breath, these products only temporarily relieve the symptoms without treating the cause. Instead, the first step in controlling bad breath is to practice good oral hygiene: twice daily brushing, daily flossing, and tongue cleaning. We can review your home care to make sure that all sources of bacteria are controlled, from brushing and flossing techniques. In fact, a plastic tool called a tongue scraper will actually allow you to clean away bacterial build-up on your tongue and significantly alleviate odor. And good hygiene must include regular dental check-ups, since professional cleanings do a much more thorough job of eliminating bacteria and plaque build-up. A second step to note is that if you have dentures or a removable retainer or mouth-guard, you must also practice excellent hygiene each time you remove the appliance, cleaning it thoroughly and according to proper instructions. Third is making sure your mouth is free from infection (decay and gum disease are infections). Periodontal disease will certainly create a bad smell but is much more serious than just the smell because periodontal disease breaks down and eventually erodes the bone. Less commonly, bad breath may result from a systemic problem such as a sinus infection, digestive disorder, diabetes, kidney failure, or liver malfunction. In these cases, we’ll refer you for a medical consultation. Radiation treatment for cancer may produce a dry mouth that leads to halitosis, as well. And several simple, non-medical conditions can occasionally have a temporarily negative effect on your breath: stress, dieting, snoring, advancing age, and hormonal changes. Regardless of the source, it's important to realize that bad breath is treatable and steps can be taken to correct it. We do see a few people who have bad breath for none of these reasons. In those cases, it's the type of bacteria that normally reside in their mouth that is producing the odor.